Become a nail technician and express your artistic side. 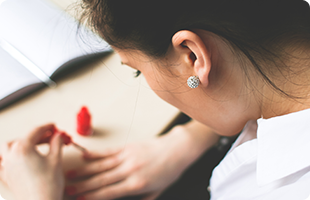 Learn the skills to become a top nail technician. Increase your value and your take home pay. Begin your career in Nail Technology today! Upon completion of the Manicure Course, you will be able to perform all the manipulative skills of giving a regular and oil manicure, hand and arm massage, artificial nails, and all related skills as evidenced by at least 70% grade on an exam given by the school before graduation. Upon completion of the Manicure Course, you will be able to comprehend all the technical information of the above skills as evidenced by a grade of at least 70% on a theory exam given by the school before graduation. At the conclusion of the Manicure Course, successful performance on the state exam, and receipt of a license in manicuring, you will be qualified to secure a position as manicurist in a manicuring or beauty salon practicing the skills you have learned.